They had been America’s most promising new act back in ’72 thanks to hit singles “Witchy Woman” and “Take It Easy”, but by their third album, “On The Border” (1974) the future didn’t look so bright. Their second album, “Desperado”, had been close to a commercial disaster, and “On The Border” struggled to recapture lost territory stalling at #17 on the Billboard chart. However, the last track on that album, the slow smoocher “Best Of My Love”, came to rescue when released as a single. It hit the shops in November ’74, but took its time eating into people’s brains like a virus and finally hitting #1 on March 1, 1975. 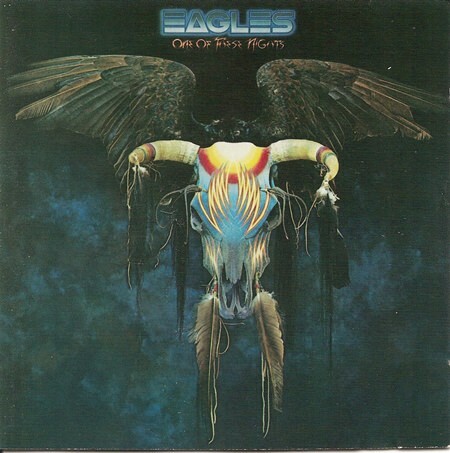 In Vietnam a war was being lost, the collapse of Saigon imminent, and when Eagles’ fourth album, “One Of These Nights”, arrived in June 1975, the Vietnam war was history. Everybody lost the war, it tore the nation to pieces, and the Eagles offer the bitter taste of defeat dressed up as sad songs about lost love, pain and betrayal. But they also leave hope for reconciliation in a gloomy darkness populated by demons and angels. The last track is after all called “I Wish You Peace”. Building on the success of “Best Of My Love”, “One Of These Nights” sure came at the right time. It is perhaps their finest album. Some of the chemistry disappeared when Bernie Leadon left in December 1975, replaced by Joe Walsh. The Eagles ceased to be a five man collective after that, pushing Randy Meisner out in the side wings for “Hotel California” after which he too left. “One Of These Nights”, was a huge seller, their first #1 album – and three of the songs went Top 5 when released as singles (the title track even hitting #1). There’s not a weak spot on the album. In the gorgeous “Take It To The Limit” Meisner’s voice sure lives up to the song’s title; Leadon delivers gold with the semi-epic instrumental “Journey Of The Sorcerer” (used as the theme song of “The Hitchhiker’s Guide To The Galaxy” by the BBC) and the sugar sweet sigh “I Wish You Peace” (written with among others Ronald Reagan’s daughter). The title track is all goose pimples, a mighty, mighty song, wonderfully arranged and recorded. “After The Thrill Is Gone” and “Hollywood Waltz” are big ones too. The tear jerker “Lyin ‘Eyes” never strays from its hypnotic tick-tock shuffle as the story of secret love and betrayal unfolds, immaculately sung and played, but a bit too close in mood and topic to the great “Ruby, Don’t Take Your Love To Town”, only the Vietnam vet in a wheelchair is replaced by an old, rich and cold hearted man, a twist that makes it easier for the listener to sympathize with the girl, even if she betrays him. Me, I think Eagles went all wimpy as they could have developed the Ruby-motif further, and 1975 was the perfect time to do it. “Lyin’ Eyes” is thus a missed opportunity. Why should I feel sorry for a girl that obviously married the guy for his money and is now stuck in her own greed. Good performance, though. Anyway, the album turned the Eagles into superstars. It is easy to understand why.